Could the new Vaio step up from the Duo 13? Sony has dropped the biggest hint yet that it will be showing off a new Sony Vaio laptop-tablet, accidentally releasing a video showing off a paper version of the device. The video, which has mysteriously now been set to 'private' on YouTube, was spotted by SlashGear. And while it doesn't exactly show what the device will look like – unless it is actually made of paper, in which case we definitely don't recommend getting it wet like the Sony Xperia Tablet Z – it does reveal a little bit about how the hybrid will work. According to the footage you will obviously be able to fold the device into tablet or a laptop but there will be a Viewer mode as well. This means Sony is targeting the likes of the Lenovo IdeaPad Yoga 11S. 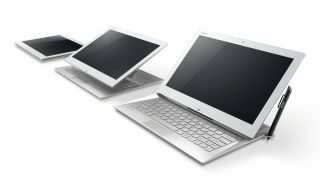 This isn't the first time that Sony has released a hybrid device – at last year's IFA it showcased the slide-out Sony Vaio Duo 13. Given that Sony likes to try and push out a number of 'world's firsts' at tech shows and the fact it is hinting that the new Vaio will be "paper thin" in the video, then we reckon a world's thinnest hybrid could be on the cards. All will be revealed when IFA 2013 takes over Berlin in September.